A Cooper’s hawk flies overhead. 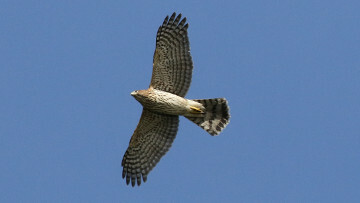 Note the broad rounded wings and long tail, which make the hawk agile and maneuverable, enabling it to chase birds through tree-filled woods or through suburban landscapes filled with man-made obstacles. Spring is officially just days away, but branches are still bare, giving us decent glimpses of birds that are returning or passing through. It can be a good time to spot woodland hawks that prey on other birds, such as Cooper’s hawks. Some Cooper’s hawks (Accipiter cooperii) are with us year-round, but many more pass through in March through April, as they migrate north. They’ll move through again in September through October when many go south. Cooper’s hawks are specialized for capturing birds. How so? They are slim and especially agile and maneuverable, so they can chase other birds through the woods and, increasingly these days, through suburban and even urban areas filled with obstacles such as buildings, utility poles, and plantings. They are maneuverable thanks to wings that are wide and rounded and a long tail that serves as a kind of rudder in quick turns. The slots between feathers on their wingtips provide extra lift for soaring, for slow flight, and for carrying prey. Like many other predators, Cooper’s hawks have front-facing eyes. Like other hawks, they seize prey with their feet and pluck its feathers with their sharp hooked beak. They typically kill their prey by squeezing it repeatedly. Cooper’s hawks usually hunt in forests, woodland edges, and fields, but if you spot one in the trees near a bird feeder, you’ll know it has come for the birds, not for seeds or suet. It’s probably most interested in the mourning doves cleaning up spilled seed on the ground under the feeder. Cooper’s hawks are stealthy and typically make surprise attacks on their prey. They fly from tree to tree, perching briefly at each stop to watch for prey. Cooper’s hawks go for medium-sized birds, such as mourning doves, pigeons, and European starlings – which are common in suburbs and cities – as well as robins, blue jays, and flickers. 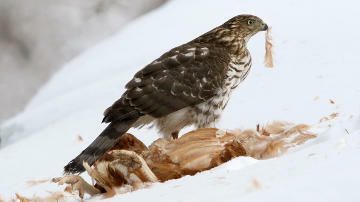 A juvenile Cooper’s hawk feasts on a chicken caught at a local farm. In by-gone days they were known as chicken hawks, and even today a Cooper’s hawk might take a chicken from a flock. They also sometimes take small mammals such as chipmunks. Smaller hawks and owls also can become prey. Cooper’s hawks don’t bother with hummingbirds, and even house sparrows – numerous but small – are not favored as menu items. An adult Cooper’s hawk itself might occasionally become a meal for a larger bird of prey, such as a red-tailed hawk or a great-horned owl. Cooper’s hawks are more or less the size of crows. It’s “more or less” because females are about 30 percent larger than males – enough larger that the meal-sized males have to be careful around their mates. When a pair gets together for the breeding season, the female is usually dominant. During the rest of the year, Cooper’s hawks are solitary. The male does most of the nest-building, creating a stick nest lined with bits of bark, about two-thirds of the way up a large tree such as a white pine. The female usually lays 3-5 eggs (about one every other day), does most of the incubation, and tends and defends the chicks in the nest. The eggs hatch at different times, so the older chicks get a head start on the younger ones. The male spends about three months bringing food, first for the female on the nest, then for the growing chicks in the nest, and finally for the juveniles during their first month out of the nest. When prey is abundant, all the chicks survive, but in lean years the younger, smaller ones are apt to starve. Cooper’s hawks look very similar to another bird-eating woodland hawk, the sharp-shinned hawk (Accipiter striatus), which also passes through our area in spring and fall. Both hawks have wide bands on their long tails. Males of both are blue-grey on top and lighter underneath, and females and juveniles are brown on top. One difference is size, but it’s often hard to judge. Sharp-shinned hawks, or “sharpies,” are smaller –more or less the size of blue jays. They too have a difference in size between males and females, with females being larger. Female sharp-shinned hawks and male Cooper’s hawks can be about the same size. Sharp-shinned hawks prey on small birds such as sparrows, thrushes and warblers, and they’re more likely to keep to the woods than Cooper’s hawks are. Cooper’s hawks occasionally eat sharp-shinned hawks. Cooper’s hawks have been doing well in our area in the past 25 years, but this hasn’t always been so. In the 1800s and early 1900s, when farming was more widespread (although decreasing), they and other hawks were often shot. Then in the mid-20th century, their numbers decreased due to DDT use. Since then, their numbers have been recovering. Not only have human threats to them been reduced, but Cooper’s hawks have been adapting successfully to changes brought about by humans in the past half-century. These changes include the return of woodlands as farms have disappeared, the increase in suburban and urban areas, and the increase in certain birds that thrive around humans, such as mourning doves, pigeons, and European starlings. In the weeks ahead, take advantage of this period before the trees leaf out and keep your eyes open for Cooper’s hawks and sharp-shinned hawks, as well as other birds.